openSIS is written in the PHP programming language and uses the MySQL database system to store information. The community edition is released under the terms of the GNU General Public License, is free software and can be downloaded from the Sourceforge website. Epoptes (a Greek word for overseer) is an open source computer lab management and monitoring tool. It allows for screen broadcasting and monitoring, remote command execution, message sending, imposing restrictions like screen locking or sound muting the clients and much more! It can be installed in Ubuntu, Debian and openSUSE based labs that may contain any combination of the following: LTSP servers, thin and fatclients, non LTSP servers, standalone workstations, NX or XDMCP clients etc.It’s a partial rewrite of an older application called sch-scripts, which has been successfully used the last year in about 250 Greek schools. Epoptes already has a lot of features, but a lot more are planned, and it’s being developed at a very fast pace. It’s maintained by IT teachers and students, so it should be around for a long time! Fedena is developed on the powerful Ruby on Rails framework, view a demo here. Fedena is a free and opensource school management software that has more features than a student information system. Use fedena to efficiently manage students, teachers, employees, courses & all the system & process related to your institution. Fedena gives you complete control over how you want to manage your school’s databases and provides many tools to organize its activities. It is a complete SIS plus with all the advantages of a perfect school ERP. With fedena there is no need of any extra hardware or technical maintenance staff. All you need is a computer with internet connection. You can operate fedena even with a mobile phone. The official website claims that anyone with basic knowledge in computers will be able to use Fedena on first login without any instructions, but if you want support there is also a commercial site at www.fedena.com that can help you in the setup of the product. Fedena is used by the Education Department of Government of Kerala to automate the system and process of over 15,000 schools in the state and is named as Sampoorna. The benefits of making use of open source software or application can be said to be as follows: One it helps save money, which can now be used for other important things. Secondly, it gives educators several more options. Since there are so many applications that can help with teaching different subjects as well as with school administration as a whole. Jason Phillips - Jason Phillips is a high school administrator and reviews software useful for schools and games. For those interested in education and open source, it might be worth checking schooltools.org. SchoolTool is an open source student information system including demographics and personal data, gradebooks, outcome and skill tracking, attendance, and calendaring. SchoolTool is used globally as part of the Intel Learning Series, by career and technical educators across the commonwealth of Virginia, and individual schools and programs around the world. We've got one step installation on Ubuntu Linux, strong internationalization support, and a 100% open source platform based on Python. @Tom, interested in covering this resource for our site? I was thinking I could write about our collaboration with the Arlington Career Center and Virginia CTE Resource Center on a competency tracking component called CanDo (http://cando.cteresource.org/). How many words would you want? Email me over at jnovelli@redhat.com and we'll discuss further, thanks! Thanks Robin and Tom! Would either of you be interested in elaborating further for our audience? It is entirely web based and can run from a centrally located division wide server or a single computer in a school. It is designed to support an entire division on one or more central computers but can also work just fine for a single school. Currently several school divisions use this approach and have 15+ schools on a single central server. This is because it is designed to be lightweight both in server resource requirements and in communication bandwidth. I'm an absolute fan of Open Source. I've got some followers on Twitter that pointed me out to schooltool.org when I posted this article on Twitter. I've not used it myself though. I am missing the differentiation between ict class control software (like epoptes) and school admin software like schooltool and openadmin for schools. What happened to iTalc? As a 3rd important section of types of 'school' software you could add electronic learning environments like moodle, chamilo and open sankoré. Thanks for the article Jason. It might be interesting to note that in British Columbia we are a year and a half into an enterprise-scale Student Information System called openStudent. Unlike most other SI systems, this student information system is being built to operate at the multi-district, state or province level. It encompasses a role-based security model, distributed hosting, cross-enrolment, continuous entry and many other significant advantages. It is also designed to interoperate with other district and school programs though the use of LDAP and other protocols. The core program is designed for elementary schools and will begin beta testing by April 2013. Embedded Reporting, Ad Hoc and business analysis is facilitated with the community version of JasperSoft Business Intelligence software. Functionality for middle and secondary schools will be available by 2014. Thanks very much for the comment Jen. Since 2000 we have been implementing open source software in schools using Linux as the operating system and a host of OS applications. As an example, our students began by using StarOffice, then OpenOffice and now LibreOffice - quite a progression over the years. The openStudent project is a logical outcome of our use of open source software and I would be very pleased to elaborate on the history and what led us up to this point. Thanks again for the articles you and so many others contribute. It's one of my primary sources of open source information. 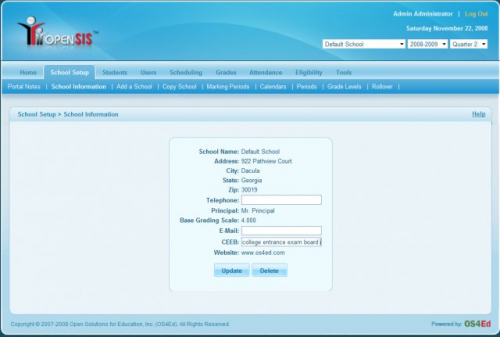 openSIS is one of the best and widely used student information system / school management system . As it is open source so it is cheap to acquire, and the technical support that openSIS team provides is the best compared to others. HI , I am very interested in an open source K to 12 on line learning curriculum. I would like to find a supplement for a child or parents that want to offer a curriculum in step with their respective grade level. In our case it might not be used by the teachers or sanctioned byt the school so it will be truly a supplement to their school day. I've been built Academic Information Systems using Open Source. Beside the security, quality and customizability, another ‘wins’ are we can reduce the complexity and improve the maintainability of software.